The following cue sheets are for rides in the Saranac Lake, NY area, starting from the Saranac Lake Area Chamber of Commerce (SLACC). Enjoy! (pink) 3 miles 228 feet KID FRIENDLY: Start along Lake Flower and enjoy a casual ride through Saranac Lake to Moody Pond. Ride around Moody Pond, which is beautiful! It has quiet pond views as well as mountains off in the distance. It's worth doing an extra 1-1/4 mile loop around. Stop, or come back later, to hike Baker Mountain with its spectacular views of the village of Saranac Lake as well as the Saranac Lakes themselves. Ride back through the historic Village of Saranac Lake and stop to enjoy lunch or just a snack. 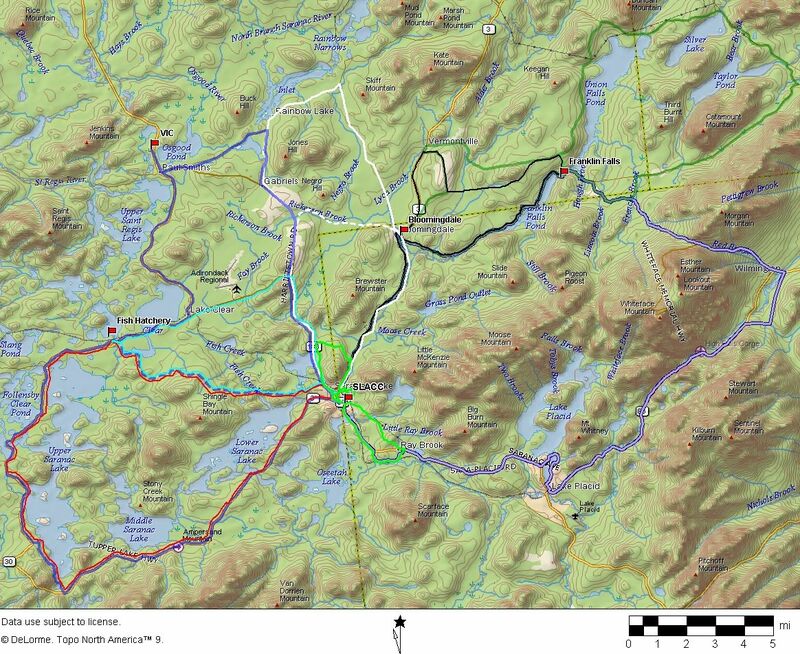 Saranac Lake's ponds and mountains are looped by this 8-mile ride. Ride through Saranac Lake historic downtown, then climb on easy slopes around Mt Pisgah, the local ski mountain. Enjoy history with a ride past Robert Louis Stevenson cottage. Ride around Moody Pond, which is beautiful! (worth doing an extra 1-1/4 mile loop around). Come back later to hike Baker Mountain. 14 miles of Saranac Lake waters and views are seen on this ride. Ride along Lake Flower, with its wide, still water. Then bike past wetlands and on quiet Raybrook Rd. Loop back to Saranac Lake, passing Lake Flower to the town hall and historic downtown & join the Mt Pisgah ride described above. (white) 18 or 27 miles 1094 or 1423 feet Bloomingdale Split Rock: Ride along the Saranac River, past farms with lamas, horses, and river views. From Bloomingdale, a short climb leads to a gentle downhill run, with mountain views. Look for the huge split rock, along Split Rock Road. Coincidence? Bloomingdale Onchiota Gabriels: This ride adds gradual climbs and forest lined roads to the Split Rock ride. After Bloomingdale, ride on quiet roads past Rainbow Lake and Jones Pond. Climb out of Gabriels to a plateau with panoramic views of the high peaks. On both rides, stop at the Harrietstown Cemetery for the scenic vista of mountains. Then enjoy Donnelly's daily flavor of ice cream. (light blue) 22 miles 1481 feet The ride follows Forest Home Road, past Little Colby Pond and Lake Clear, an enjoyable climbing route outbound. The ride turns more gradual, swinging onto Fish Hatchery Road. Stop at the Fish Culture Center, Check out the salmon raised here, in the building out back. Then follow SR 30 along Lake Clear to Lake Clear Junction. Stop for lunch at Charlie's Inn (over 120 years old) or continue on SR 186 for ice cream at Donnelly's. Then do the downhill run on SR 86, passing Lake Colby, back into the Village of Saranac Lake. (red) 36 miles 2448 feet The ride follows SR3 past Lower Saranac Lake, with beautiful views of Crescent Bay and Pope Bay. Turn off on CR 45, passing a peaceful lily pond and up a short climb. The ride turns more gradual, along roads past Fish Creek Pond. Swing onto Fish Hatchery Road; stopping at the Fish Culture Center . Check out the salmon raised here in the building out back. Take Forrest Home Road over the hill, passing Lake Clear and Little Colby Pond, back to Saranac Lake. (black) 29 or 32 miles 1393 or 1736 feet Franklin Falls Start along the Saranac River on gorgeous, rolling roads with beautiful views of the water. Stop and pause before the bridge at Franklin Falls. Look out over this open pond and soak in the Adirondack peacefulness. Norman Ridge to Franklin Falls This adds the wonderful, panoramic mountain views on Norman Ridge to the Franklin Falls ride. Climb up on Norman Ridge Road and ride along the ridge enjoying the mountain panoramas. Then down Fletcher Farm Road to Franklin Falls Road. Stop & look at beautiful Franklin Falls Pond. For a 16-mile loop, start in Bloomingdale, parking behind the Town Hall (OK on Sundays). Then follow River Road to Franklin Falls. (dashed blue to blue) 37 miles 2238 feet The ride follows Forrest Home Road, past Little Colby Pond and Lake Clear, an enjoyable climbing route outbound. The ride turns more gradual, swinging onto Fish Hatchery Road; stop at the Fish Culture Center . Visit the VIC: birds, butterflies, hiking, canoeing. Climb out of Gabriels to the plateau. Enjoy the panoramic views of the high peaks. Take in the scenic overlook at the Harrietstown Cemetery. Enjoy the daily flavor of ice cream at Donnelly's. (blue) 53 miles 3135 feet The ride follows SR3 past Lower Saranac Lake, with beautiful views of Crescent Bay and Pope Bay. Turn off on CR 45, passing a peaceful lily pond and up a short climb. The ride turns more gradual, along roads past Fish Creek Pond. Swing onto Fish Hatchery Road; stop at the Fish Culture Center . (green) 56 miles 3522 feet This is a spectacular and challenging Adirondack ride, along rivers, 4 lakes, and through wilderness. Take food and water. Starts gently along the Saranac River on gorgeous, rolling roads with beautiful water views. Stop and pause before the bridge at Franklin Falls. Look out over this open pond and soak in some Adirondack peacefulness. Quiet climbs and descents lead to a quick view of Whiteface Mountain. Then on Plank Road, get an eye full of Catamount Mountain! Follow the Catamount cliffs, before turning towards Taylor Pond and Silver Lake. Some more hills bring you to beautiful Union Falls Pond. The loop takes you to the panoramic mountain views on Norman Ridge. Or before Norman Ridge Road, take a short side trip to the local deli. (purple) 48 miles 3760 feet Around the Block is taking on the Adirondack Mountains. No shortcuts available. There is the gentle start along the river, then a climb up a saddle next to Whiteface Mountain, followed by an amazing 3-mile descent into Wilmington. Take a break for food and say "Wow". In Wilmington, a side road takes you past the more historic homes of the village. Then turn on SR 86 and ride past the Whiteface Mountain Olympic Downhill Ski Area and High Falls Gorge. Loop around the east side of Mirror Lake, to avoid busy downtown Lake Placid. When you get to the north end, you can go straight into Lake Placid or turn right on Saranac Ave (SR86) towards Saranac Lake. The last leg is a busier route, with a short respite on the quiet Raybrook Rd. (starts like the white loop but goes off the map) 68 miles 4210 feet This is a spectacular and challenging Adirondack ride that goes through the downtowns of Bloomingdale and Onchiota before heading into the wilderness. Take food and water, there is a 50-mile stretch with no services. Starts gently along the Saranac River on gorgeous, rolling roads with beautiful water views. Ride along Loon Lake then take a roughly paved road for nine miles with nary a building to be seen. Lots of aquatic wildlife however! Return toward civilzation along SR30, stop by The VIC for some light hiking. And, of course, Donnelly’s Ice Cream. But, just before the ice cream stop, don’t miss the spectacular view from the Harrietstown Cemetary, people are dying to get in there:).